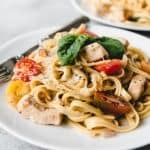 One Pot Bruschetta Chicken Pasta is a full-flavored pasta dish made with tender chicken, garlic, fresh basil, and bright cherry tomatoes. It's an easy weeknight meal made entirely in one pot with all the flavors of my favorite bruschetta (pronounced “broo-sketta”, not “broo-schetta”). Heat oil in dutch oven. Season chicken with salt and pepper, then brown a few minutes without stirring. Brown a couple minutes more then transfer to a plate. Add chicken stock, chopped tomatoes, sliced garlic, linguine pasta (may need to break in half to fit into the pot), and all the herbs and spices through the salt and pepper. Cover with a lid and bring to a boil. As soon as the liquid is boiling, add the chicken and stir, then lower heat to medium-low and simmer for 8-10 minutes, until the pasta is al dente and the chicken is cooked through, stirring occasionally so the pasta cooks evenly and doesn't get stuck to the bottom of the pot. If necessary, add additional liquid 1/2 cup at a time if it looks like the pasta is drying out too much. There should still be a decent amount of liquid left in the pot after 8-10 minutes, but it will continue to be absorbed and create a delicious sauce so never fear. Remove from heat and add the cream, cherry tomatoes, basil, mozzarella balls, and Parmesan cheese and toss well to combine. Serve immediately with additional Parmesan and basil to serve over top and balsamic vinegar on the side for drizzling over the pasta, if desired.